MEL Secure Systems, the leading developer of surveillance and security solutions, has announced the immediate availability of Domehawk IQ, a new rapid deployment CCTV solution. It is the first PTZ dome camera to feature the latest low power IR-III night vision technology which costs up to 90% less to run during night operations in a wide range of outdoor applications including parks and other poorly lit or zero light locations. The new Domehawk IQ uses IR-III night vision technology which uses less than 6W to run, compared with 30-60W used by traditional multi-LED equipped cameras, as well as being up to 10 times brighter. This IR-III technology tracks the movement of the zoom lens to direct the light where it is needed most instead of floodlighting the whole area to deliver higher quality images whilst increasing the effective range of the camera to over 150 metres in night vision mode. It also eliminates the whitening caused by solarisation when recording events close to the camera. This intelligent CCTV camera solution provides a full 360 degree horizontal pan capability and uses the latest advanced motion motor control hardware and software to deliver virtually silent operation and more accurate pre-set positioning. Transmission is via COFDM Video and UHF Telemetry used enabling high quality, interference-free images to be received at distances of up to 4km without requiring line of sight. 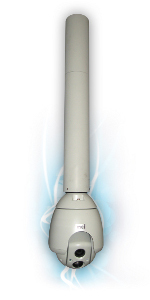 Domehawk IQ is available in 1.3GHz, 2.4GHz, and 5.8GHz bands and multiple cameras can be deployed within a single frequency. It can also be used with IP networks and is compatible with all existing MEL rapid deployment kits. Domehawk IQ can also be equipped with an onboard DVR with the capacity to store up to 32GB of HD video images. Recordings can be quickly and easily downloaded via Wi-Fi or 3G using a mobile phone, laptop or tablet computer.